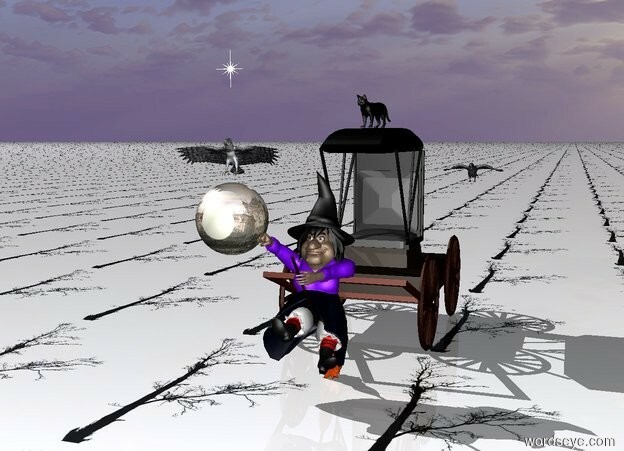 Input text: The witch is at the carriage. the ground is tree. the crow is 65 inch above the ground. it is right of the carriage. The large [castle] ball is left of the witch. it is 44 inch above the ground. The harpy eagle is 2 inch above the ball. The black cat is on the carriage. it is facing the ball. The sign is 16 inch above the harpy eagle.